Two years ago, we got a hand me down twin mattress and frame for Vincent. It’s a simple, 100-year-old steel bed, reminiscent of an old hospital bed. 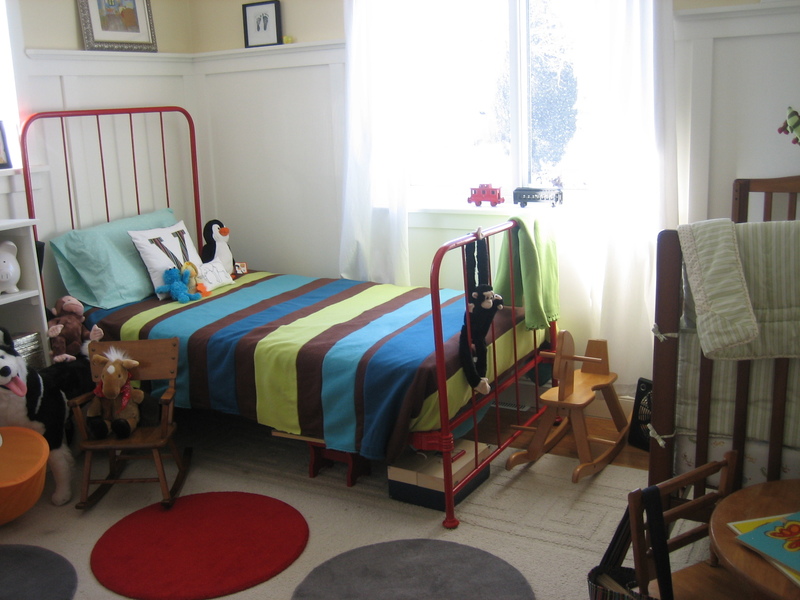 The frame was green, but we painted it red to work better in Vincent’s newly designed room. I loved it, until recently. 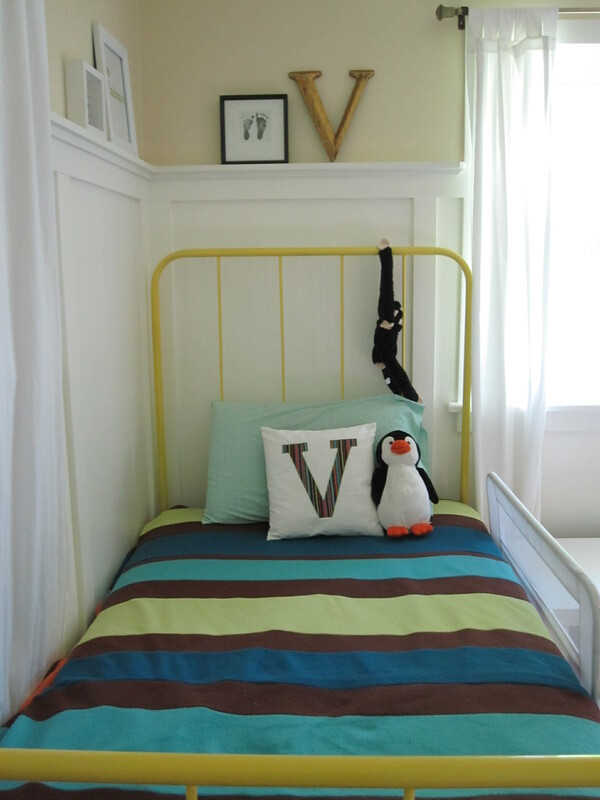 Now, I want to add a light aqua, lemon grass green and sun yellow to freshen up our boys’ room without repainting. Initially, I wanted to make an upholstered headboard, but that would require buying a new mattress, box spring, and frame because the current bed is about 5 inches wider than standard twin beds. We don’t want to buy a new bed yet, so we opted to repaint the bed frame. I sent Ben to the hardware store and he picked up Rustoleum’s Sun Yellow spray paint. Rustoleum claims to have 2 times the coverage, so maybe we won’t have to prime. 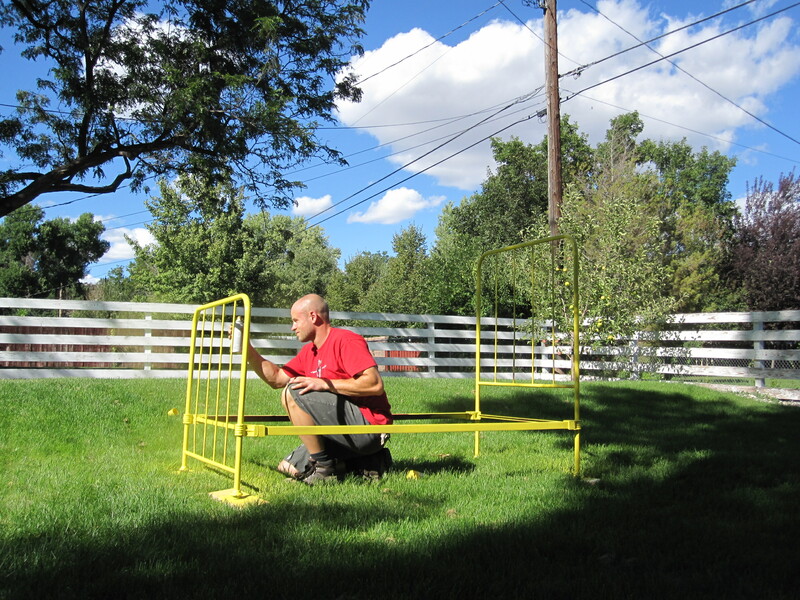 After disassembling the bed and setting it up outside on wood blocks, Ben started painting. Sure enough, Rustoleum does have two times the coverage. 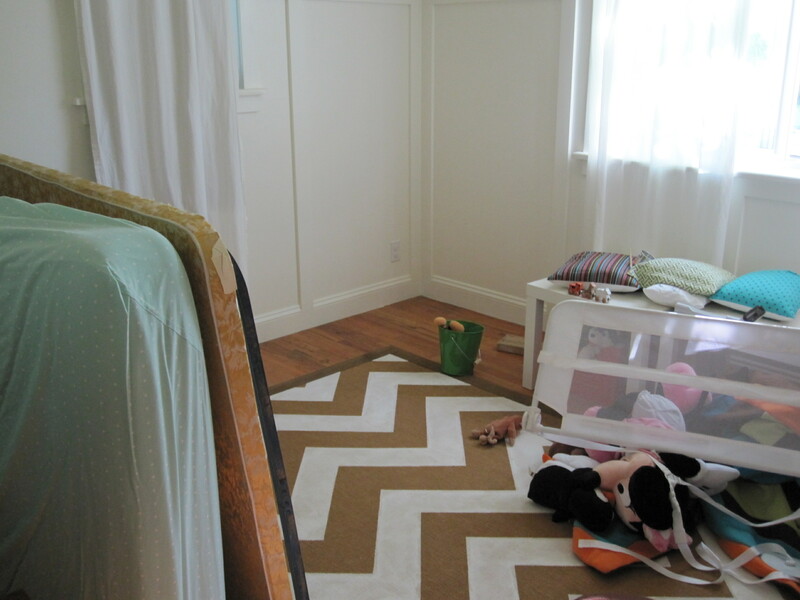 While Ben was painting, the boy’s room was a mess. Fortunately, it didn’t last too long, but here is what it looked like. Better yet, Rustoleum dries to the touch in 20 minutes and to handle in 1 hour. That’s great for impatient people, such as myself. We left the bed outside for 5 hours or so, just to let it air out. We brought it inside and added bedding. Vincent did not sleep in the bed, as it was a little smelly, but I love the new look. 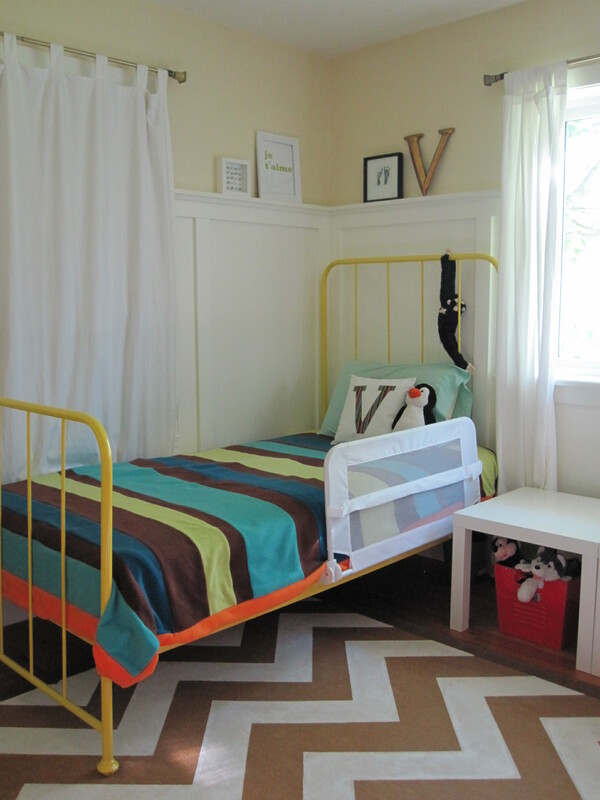 I really love the yellow bed with the chevron painted rug. Next step, bedding! I have debated between a sun yellow/charcoal grey color palette and sun yellow, light aqua, and lemon grass-green. I think the yellow/grey is a little too sophisticated for a kids room, so we decided on yellow, aqua and green. What is your favorite color combination? I turned out adorable! I can’t wait to see the new bedding with it. Thanks for the kind words, everyone! V’s favorite color is yellow, so he really loves it. And it was super easy and cost about $10.00. I think I like the yellow better than the red as well. There is something really versatile about yellow. It goes with so many pallets, and always brings a certain cheerfulness to any room. And even though the yellow and gray is too sophisticated now, it’s a good possibility for the future – especially if he continues to love yellow. Just wondering what brand and where you got the bed rail on Vincent’s bed? My toddler is about to make the move and I’m in the market for one. The roll gaurd/bed rail is made by Safety First and we bought it at Target. This one is similar: http://www.target.com/gp/detail.html/180-9972453-7172147?asin=B000YDGVMY&AFID=Froogle_df&LNM=|B000YDGVMY&CPNG=furniture&ci_src=14110944&ci_sku=B000YDGVMY&ref=tgt_adv_XSG10001 But you can google around to see where there might be a cheaper version. We do love this as it is really easy to use and is secure. There is a strap that goes under the mattress to keep it from getting loose. I LOVE this bed….why oh why can’t people pass cool things down to me?!? 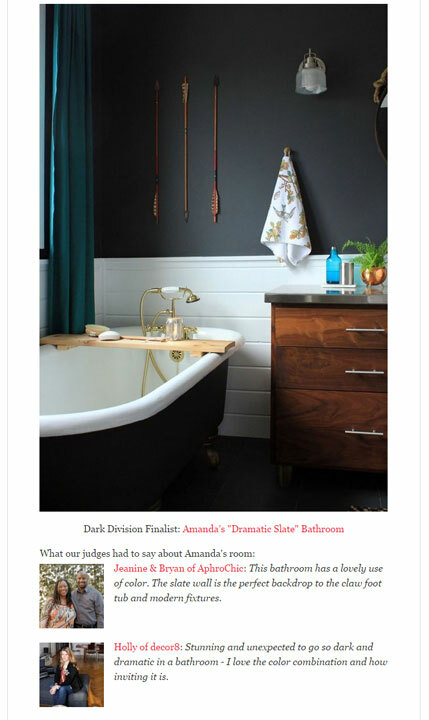 Have you seen similar styles anywhere by chance? Oh, I know the feeling. I see some things people get by the side of the road and I am soo jealous. 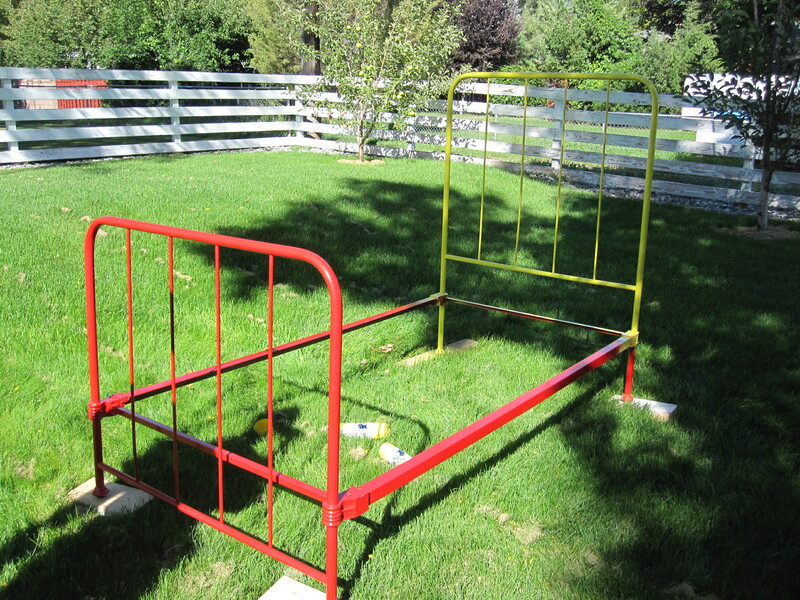 IKEA has a similar-ish bed: http://www.ikea.com/us/en/catalog/products/S59839332 A coat of bright, fun spraypaint would add a custom touch. I really love this bed!! I have seen similar frames at resale shops, but am hesitant to buy them because of their size. Do you have a special-sized mattress for this bed? Would love to know! Thanks!! It is a special sized bed. I think it is 4 inches wider than a standard twin, but the mattress came with the bed. If you’re going to put the bed against the wall, you could fill that last few inches with foam and cover it with a sheet. New, standard sized twin bedding fits because the sheets are made for deeper mattresses. Hope that helps!